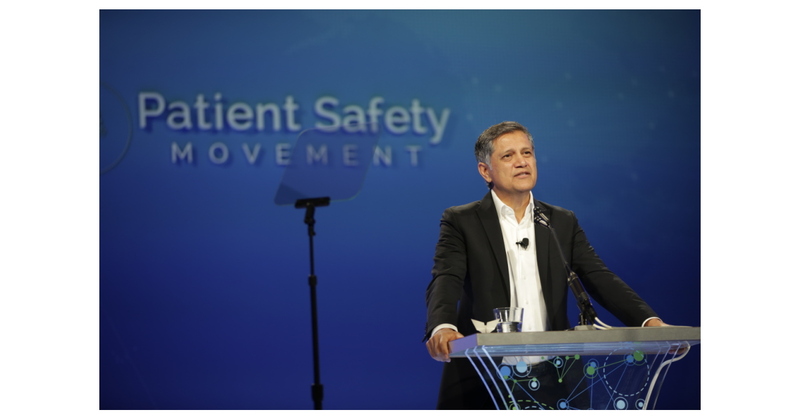 IRVINE, Calif.–(BUSINESS WIRE)–The Patient Safety Movement Foundation (PSMF) announced today at the 7th Annual Patient Safety, Science & Technology Summit that 90,146 lives were saved in 2018, thanks to the efforts of more than 4,710 hospitals committing to patient safety, and 89 healthcare technology companies that have signed the open data pledge. A total of 273,077 lives have been saved since the anniversary of the first summit in 2013. Leadership Announcements: Kiani also announced that David B. Mayer, MD, will serve as the Chief Executive Officer effective immediately, and that Michael A. E. Ramsay, MD, FRCA, was named Chairman of the Board effective after the 2020 Summit. Dr. Mayer was one of the architects of CANDOR, which focuses on transparency, immediate root cause analysis and education and when implemented at Medstar has reduced preventable deaths by nearly 50% and saved the system $70 Million. Dr. Mayer also serves as the Executive Director of MedStar Institute for Quality and Safety and previously served for almost seven years as MedStar Health’s Vice-President for Quality and Safety. He was selected by the International Society for Quality in Healthcare (ISQua) as an International Quality and Safety Expert and has been presented with the 2013 Founders’ Award from the American College of Medical Quality and in 2016, the Patient Safety Movement Foundation’s Humanitarian Award. Summit Presentations: During today’s proceedings, world-renowned patient safety expert Dr. Peter Pronovost provided a keynote on going from healing in the hospital to being healthy at home. Dr. Kai Zacharowski, Director of the Department of Anesthesia, Intensive Care Medicine & Pain Therapy, University Hospital Frankfurt, and incoming President European Society of Anaesthesiology (ESA), shared his perspective from the ESA. Dr. Steven Scheinman, Dean of Geisinger Commonwealth School of Medicine, introduced the 17th Actionable Patient Safety Solutions (APSS) on Patient Safety Curriculum for Schools. A core patient safety curriculum that can be adopted by educational programs for all healthcare professions (nursing, pharmacy, behavioral health, medicine, etc.) was released after over 18 months of development by a workgroup comprised of academics and clinicians dedicated to improving patient safety through educating the young. The curriculum will go beyond care of individual patients to address systems of care and close a critical gap in student training when they are introduced to patient safety. Hospital Leadership Panel: Transparency from the Legal Perspective. The panel of experts was joined by patient advocate Jack Gentry. He shared how a routine operation left Gentry paralyzed from the neck down. Media Panel: Journalists from USA Today, Health Service Journal, The International Consortium of Investigative Journalists, and CALMatters. They were joined by Jim Messina and patient advocate Jamie Thomas King. Jamie shared the heartbreaking story of losing his youngest son, Benjamin, in 2016 and being propelled into the world of patient safety. Steven Moreau Humanitarian Award Winner: Each year we present the Steven Moreau Humanitarian Award to a hospital administrator whose zeal for improving patient safety in their hospital is clearly prominent. This year the award was presented to William C. Wilson, MD, MA, Chief Medical Officer, UCI Health. Under Dr. Wilson’s leadership, UCI Health in Orange, California, became the first academic medical center to obtain a 5-Star ranking under the Patient Safety Movement Foundation’s 5-Star Hospital Ranking Program in November 2018. In 2018, their commitments saved 16 lives. Dr. Wilson has worked to fully engage UCI Health’s clinical staff in creating a culture of safety for their patients and families. For more information, please visit the Patient Safety Movement Foundation website. Members of the media may request a Summit Digital Media Kit, that will be updated throughout the Summit, by emailing [email protected].